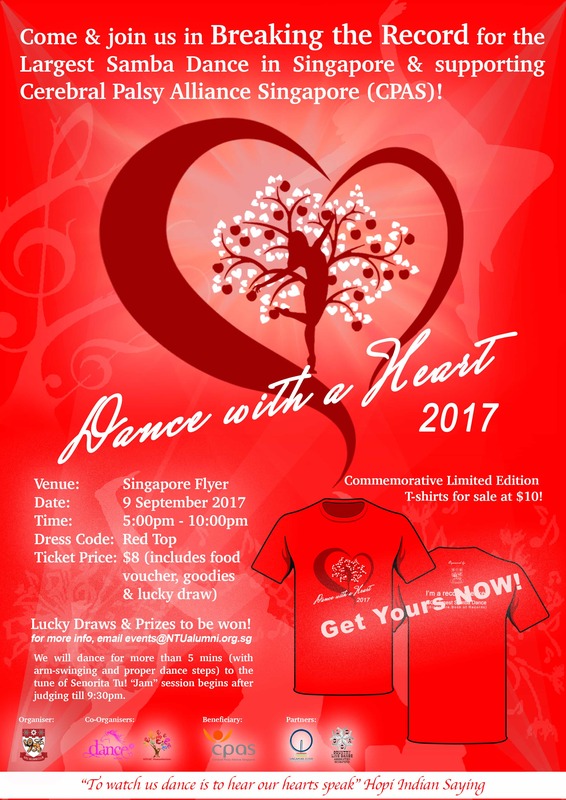 As of last evening, Sunday 20 Aug 2017, more than 100 contributors have pledged their support to the Dance with a Heart event barely 1 week after CLDAS announced it. Your donation will help to uplift the lives and ease the financial hardship of children and adults with Cerebral Palsy and related disabilities served by CPAS (Cerebral Palsy Alliance Singapore). The charity event is an attempt to break the Singapore record of Largest Samba Dance. It is organised by the NTU Alumni Club with CLDAS being an official partner. After the record breaking attempt, a line dance jam will follow till 9:30 pm. Tickets are available at $8, which includes food voucher, goodies, and lucky draw. If you book your ticket through CLDAS, we will add on a black CLDAS unisex polo T-shirt (only M and L sizes available) free to you. You can book the tickets at our regular jams or through our contact form. Come join us in a worthy cause while having fun!